It’s that time of year again. January. Resolutiontions, renewal, detox, gym, becoming vegan for the month, no alcohol and looking after your body and mind – basically, being a better version of yourself last year, even though that was only a week ago! If you’re watching what you’re eating, it’s always worth considering which ingredients you put on your skin and the impact it has on the environment too, especially if you’re trying out Veganuary. There are so many ethical brands out there and my latest favourite is Daughter of the Soil which uses 100% organic ingredients, is cruelty free and also helps to employ and empower women in Africa. 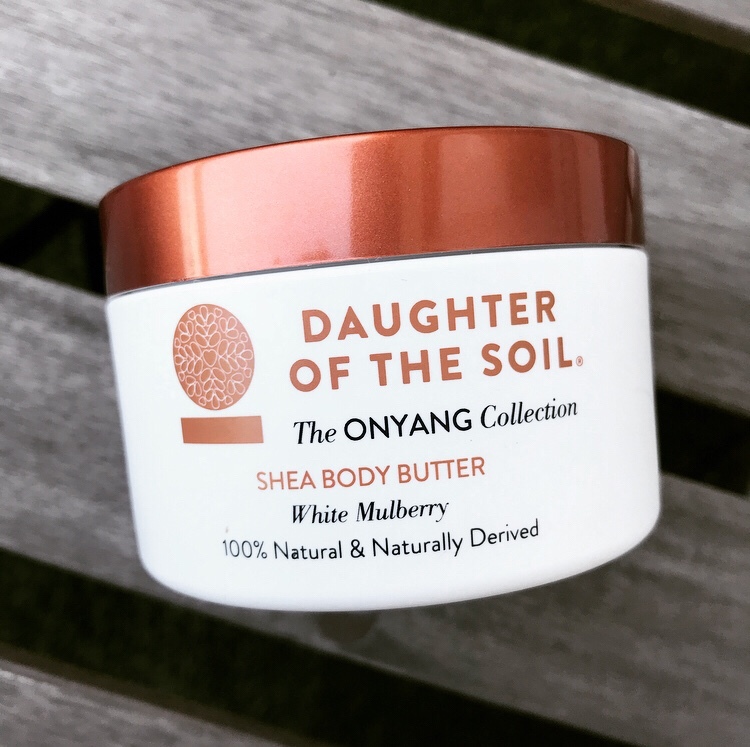 Founded by Maria Magembe, Daughter of the Soil is based on the fertile landscape of Eastern Uganda and is inspired by her great-grandmother who believed in the benefits of using nature for skincare. The products use local, simple, yet powerful botanical ingredients to target loss of elasticity and dryness, slow down signs of skin ageing and stop free radicals in their tracks to restore skin’s natural radiance. Shea Butter, the star ingredient has been known for generations to soften the skin and Maria’s great-grandmother’s timeless recipes have now been shared with the world. Detox your skincare. All products are 100% natural and naturally-derived ingredients, free from harsh synthetic chemicals that typically cause skin irritation or have toxic effects when absorbed via the skin. All products are free from Animal Testing, Parabens, Petroleum, SLS, SLES, Mineral Oil, Animal derivatives, Synthetic Fragrances, Colourants, Silicon. It doesn’t stop there, Daughter of the Soil is working with women in in Africa, providing them with employment to earn a sustainable and protected income. Connect the DOTS, the certified functional training program for women in agriculture has a goal to have 10 million DOTS certified women farmers in Africa by 2025. Building a sustainable program will create a movement of ‘DOTS certified’ women farmers, trainers and leaders – serving today as well as future generations. I tried out the White Mulberry Shea Body Butter which has totally saved my skin during those freezing days we had in December. It’s a pretty much unscented, clotted cream like moisturiser which is amazing for your skin. As well as using Shea Butter, this cream contains fatty acids and vitamins found in the East Africa which absorbs straight into my skin without feeling oily or greasy. I use if for those really cold days where I am afraid my skin will crack due to the low temperature. Due to the lack of perfumes, it doesn’t seem synthetic or fake, yet feels extremely nourishing and luxurious on the skin. making it feel soft for days. I have nearly finished my jar, below is an image so you can see the consistency.